You should treat all your experiments carefully, no matter how simple they appear to be. Although it is unlikely that you will stumble on a new law of physics during your a level course there is always a chance and careful experimental work just opens up that possibility! A good experimental technique gained at this stage could be of immense use later on. 2. Check that you have all the apparatus that you need and that you know how to use it. This is especially true of meters and power supplies - ask for help if you are not sure which output or range to use before switching on. 4. Decide on the both the spread and the number of readings that you are going to take of the various quantities. 6. Always repeat your readings if there is time and certainly check any reading that is to become a "base" value used in many later parts of the experiment. Do not rush your work! 7. All results should be quoted to a sensible degree of accuracy and this accuracy recorded. Don't claim an unreasonable degree of accuracy. Although a stop clock may show times to within 0.01 s you may only be able to judge when to press it to +/- 0.1 s and it this that should be quoted as an accuracy. 8. 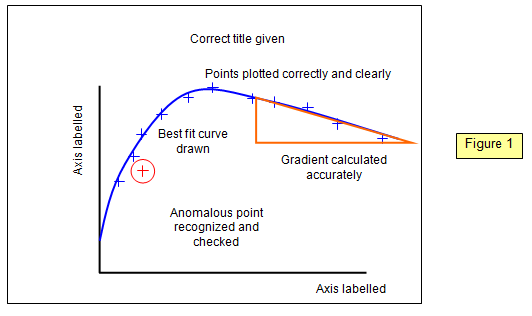 If you are asked for the gradient of a line in a practical question it is likely that the line is a straight one, but if the slope at a specified point is asked for then the line will probably be a curve. 9. Include a comment of all errors and difficulties and how you overcame them or suggestions for their solution. 10. A full and complete conclusion should appear at the end of each experimental account. Remember that experiments without a mathematical answer are just as important as those that do have a numerical result and a conclusion is still needed. 6. The line should always be the best fit curve (maybe a straight line) unless you are specifically requested otherwise.